Commonly seen being fed by people of all age ranges and walks of life, Mute Swans are a very well known form of domestic bird! Today, they are usually found in a wild or semi-wild state. 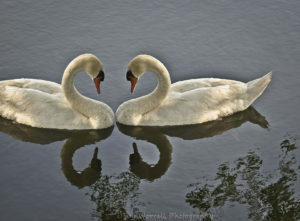 In the wild, Mute Swans will usually pair for a long time, although they have been known to change partners on occasion. They are often quite tame outside of breeding season and accept food from visitors to ponds or parks. They usually eat aquatic plants, although sometimes-aquatic invertebrates are also consumed. In order to obtain such food, Mute Swans simply plunge their necks into the water. Sometimes, in places where water has a high mineral content, the swans will have brown colored necks or heads. 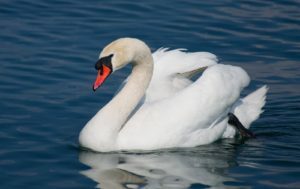 In deep water, a swan may even tip most of its body under the surface, leaving only its hind end exposed. Mute Swans generally only move location when food becomes scarce, although sometimes local seasonal migration is noted. For example, if the freshwater they live in becomes frozen, they will move to saltwater nearby. During these movements, they may congregate in flocks of about 100 swans! In the warmer weather, they make their nests along the banks or small islands of rivers or lakes. They are constructed of plant material and lined with down. After the female has laid her eggs, the male becomes extremely territorial and will defend the nest strongly. 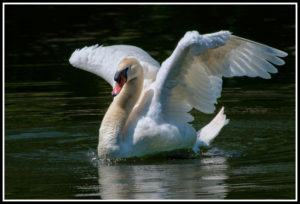 When a Mute Swan feels threatened, it will hiss and beat its wings. Sometimes, they will make purring or yapping noises also. In flight, a Mute Swan can reach speeds of up to 55 miles per hour and are among the highest flying birds. It has been reported that some have reached altitudes of over 24,000 feet! Their wing-beats are strong and may actually be heard from a distance. These swans can live for about 40 years in captivity, though 70 years of age is not unheard of! 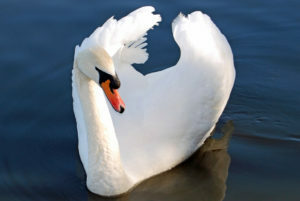 Usually Mute Swans are very large, growing to about five feet long with an eight to nine foot wingspan! These swans are characterized by an orange colored bill, which has a black base. Mute Swans also have a black knob in the forehead region. In females, the knob is smaller than in males. The rest of the swan is covered in white feathers, which are fluffy over the back. The legs and feet are black. While swimming, their heads are curved down, giving the neck and body an S shape. Mute Swans cannot make loud noises because their tracheas lack convolutions, being very straight. Male Mute Swans are known as cobs, and females are known as pens. Mute Swans have been living in a semi-domestic state for years, and at one point they were raised for meat and for their plumage. In Great Britain, owned swans were marked by nicks on the beak or webs, and un-nicked swans became “Royal Birds”, property of the crown. Round-ups were known as Swan-uppings, and in parts of Britain this tradition still continues though the swans are no longer used for meat. Mute Swans were probably introduced into the United States Hudson River Valley in the 1800’s. Today, they are widespread in ponds and rivers. 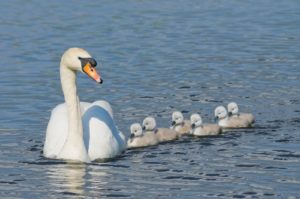 In the 1900’s, Mute Swans have been threatened by lead poisoning, since lead shot and fishermen’s hooks have been dropped in their habitats and ingested. This is no longer prevalent today. Mute Swans are alternately known as Wild Swans, Tame Swans, Common Swans or Domestic Swans. They are found in northern North America, northern and central Europe, northern Asia and even northern Africa. During breeding season, it is advisable to avoid Mute Swans! Even usually tame swans can become aggressive at this time and males may kill each other. Most often they will beat at humans with their wings rather than attempting to bite. Usually, eggs are laid between March and June, and the female Mute Swan will incubate her clutch while the male defends her. Mute Swans usually lay around six eggs, which incubate between 36 and 41 days. Usually, Mute Swans lay the eggs at two-day intervals, and incubation time begins at the last egg’s date of laying. The baby swans, or cygnets, take 115 to 155 days to fledge. They are covered in brown or gray down and may ride on the backs of their parents! By the time they are a year old, they will be white. Immature Mute Swans flock together and may pair and look for a nesting site by two years of age. Most Mute Swans die, usually in flying accidents, before they are one year old.